Trump on Blackface / KKK Yearbook Photo: "Man, I Wish I Had Thought of That." 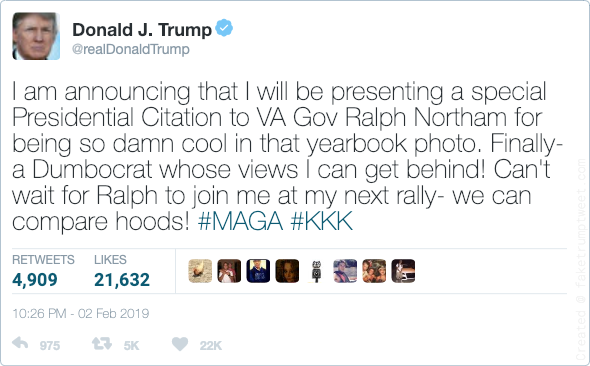 President Donald J. Trump broke his silence on the scandal roiling Virginia Governor Ralph Northam (D) in the aftermath of a photo in Northam’s medical school yearbook showing a person in blackface standing with another dressed in a Ku Klux Klan robe. Shortly after the scandal broke, White House Press Secretary Sarah Huckabee Sanders released a copy of the Northam yearbook page that appeared to include a Photoshopped image of President Trump added in between the man in blackface and the person in the KKK robe. NOTE: THIS IS SATIRE, WHICH MEANS IT IS HUMOROUSLY NOT TRUE BY DESIGN, SO CHILL OUT. We’re told to avoid talking politics at Thanksgiving. This year, we need to. Are PA Democratic Legislative Hopefuls Being Forced to Sink or Swim Before Blue Wave Hits?